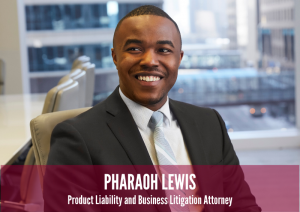 MINNEAPOLIS (March 20, 2019) – Minneapolis-based law firm Nilan Johnson Lewis is thrilled to announce its newest associate hire, Pharaoh Lewis, who joins the firm’s product liability/mass tort and business litigation practices effective immediately. Lewis joins the firm after clerking for Judge Karen Janisch and Judge Amy Dawson at the Hennepin County District Court. He began his legal career with a background in sports and entertainment law, having worked before and during law school for the Minnesota Timberwolves where he developed a passion for legal analysis, research and writing. Additionally, Lewis has legal experience with corporate in-house counsel, having worked as an extern with Target Corp.’s Law Department. Lewis received his Bachelor of Science and Master of Science in Sports Management from Barry University in Miami, Fla. He went on to receive his J.D. from the University of St. Thomas School of Law. Lewis is active with the Hennepin County Bar Association and is on the Community Outreach Committee for the Minnesota Association of Black Lawyers. Founded in 1996, Nilan Johnson Lewis (www.nilanjohnson.com) has built a practice grounded in excellence and value. Through its Total Partnership approach to client relationships, Nilan Johnson Lewis delivers exceptional results for its clients’ businesses. The firm focuses on five areas of law: product liability/mass tort litigation, business litigation, labor and employment, corporate and transactional services, and health care.